A few weeks ago there was this amazing smell coming into our apartment from my parents apartment below us. I couldn’t get enough of it and finally had to go downstairs to see what the hell she was making. It was of course some sorta meat, maybe pork?, I don’t remember but that’s not what was causing this glorious smell. It was the marinade she was baking it in and I NEEDED to know what it was. She said it was an Island Teriyaki marinade that she bought at Trader Joes. As soon as she showed me the bottle I knew exactly what company made it even though Trader Joes just slaps their own label on it: Soy Vay. I immediately scooped up a bottle at Whole Foods a day later. While checking out the ingredients I noticed that it contained pineapple. I have sadly developed a sensitivity to pineapple that gets worse every time I try to eat it. I basically said “Screw you sensitivity! I NEED TO EAT THIS!” I figured I could deal with itchy ears and mouth and throat for a hour or two or three. When I got home from the store I pressed a block of tofu in my TofuXpress, which if you don’t have one I highly recommend getting one. 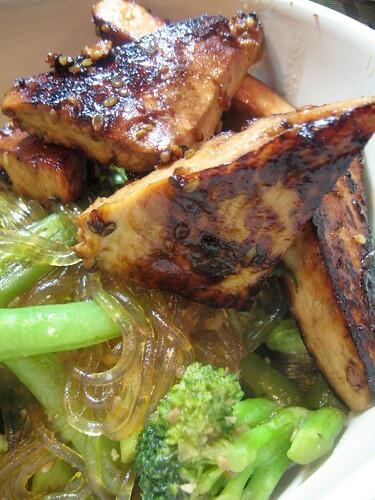 I then cut the tofu up into triangles and marinated it for an hour or so. I heated up a pan until really hot and then added a tablespoon or two of olive oil and then seared the pieces of tofu until they were nice a brown on each side. While that was happening I boiled some bean thread noodles and sauteed some broccoli and string beans with a touch of the teriyaki sauce. Once everything was done cooking I added the noodles to the pan with the veg and touch more of the teriyaki sauce to give it some more color and heated it through. Then I scooped it into a bowl and placed the seared tofu on top and dug in. It was so delicious. My apartment smelled like it did the day my Maa was using the marinade in her house below us. It was just wonderful. Reno even liked the tofu and might have even eaten a piece of broccoli. My pineapple sensitivity did rear it’s ugly self and I had some itchy ears for a bit but it wasn’t so bad which means that I will definitely be using this marinade again! Oh yeah….I think some of this is in my future. Thanks for the inspiration!! Oh, wow that looks so good. I wish I had some for my tummy!! It sounds great! I love pineapple, I don’t know what I would do if I had a sensitivity like yours to it! Probably still eat it. That looks really good. I could go for a bowl..or two of that right now. Teriyaki sauce is just so good. This dish looks delish! I’m all over that TofuXpress…thanks for the link! Happy MoFo’ing! That picture is making my mouthwater. I’ve never had SoyVay – I’ll have to get some soon. I made something similar after being inspired by this post. Thanks! Thanks for the heads up on the TofuXpress – pretty cool!